When former Nevada First Bank president Arvind Menon was chosen to open Meadows Bank eight years ago, his biggest challenges involved attracting customers in the midst of a recession and growing the community bank’s business in Las Vegas. He’s been busy ever since building Meadows Bank’s brand and market share not only in Las Vegas, but statewide. Now the bank is ready for its next move, opening a branch in Phoenix. Meadows Bank, formed in March 2008, has been profitable since 2010. Menon said recent expansion into Henderson and Reno has boosted the bank’s profitability, but moving into Arizona was simply about diversifying the customer base. He also expressed confidence the move into the Arizona banking market “will enhance shareholder value.” Those shareholders include former professional tennis player Andre Agassi and Lorenzo Fertitta, CEO of Zuffa LLC, parent company of Ultimate Fighting Championship. 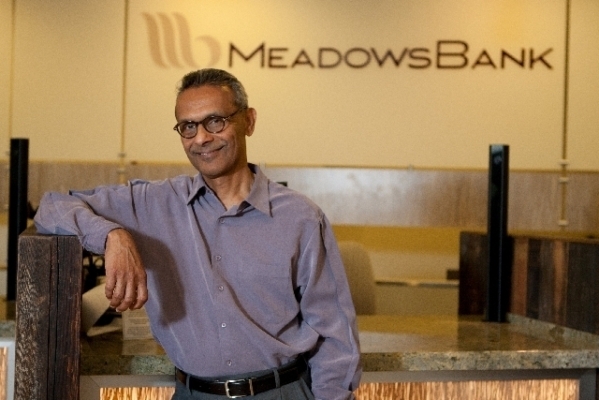 Menon added that he thought Meadows Bank had “good opportunities” in both Phoenix and Reno. The bank already employed three loan officers in Phoenix as part of their Small Business Administration 7(a) and 504 loan business. Meadows Bank also operates loan production offices in Salt Lake City, Denver, Sacramento and Dallas. Besides Henderson and Reno, Meadows Bank operates branches in Las Vegas and Pahrump. Menon said for the time being “we’re happy with one branch in Reno, but we are not done here.” Menon told the Business Press in February the bank could sustain a couple more branches in Northern Nevada, maybe in Sparks and Carson City. “We are not done in Nevada,” Menon said. That aggressiveness has allowed the community bank to grow its assets as Nevada’s economy continues its recovery. The bank recently announced that for the first time in its seven-plus-year history total assets at the end of the third quarter were above the $500 million mark, standing at $531.9 million. That robust growth was driven by increases in the bank’s loan and deposit portfolios. Net income for the first nine months of 2015 was $5.88 million, compared with $4.35 million for the same period last year. Menon attributed the double digit growth (22 percent) in net income to a significant increase in the bank’s loan portfolio. That loan portfolio was $451.5 million as of Sept. 30, a $90.5 million increase over the same period last year. Total deposits stood at $461.6 million, according to a financial statement released by Meadows Bank. Silver State Schools Credit Union posted third quarter net income of $2.7 million and year-to-date net income of $10.5 million. According to an earnings statement, the third quarter results were consistent with 2014 third quarter results of $3 million and year-to-date net income of $10.5 million. Andy Hunter, CEO of SSSCU, said improvement in credit quality continues to be a significant factor in the credit union’s financial performance. Loan delinquencies have declined from $6.9 million at the end of the third quarter last year, to $4.3 million as of Sept. 30. At the end of the third quarter, SSSCU reported deposits of $613.1 million, total assets of $660.7 million, loans of $434.6 million and regulatory net worth of $45.7 million. East West Bank, which operates a branch in Las Vegas, has agreed to an enforcement action with federal regulators to correct deficiencies with anti-money laundering requirements, according to the Federal Reserve. The 10-page agreement comes after recent examinations conducted by the Federal Reserve Bank of San Francisco found problems in East West’s compliance with certain anti-money laundering laws, including the Bank Secrecy Act. According to the deal, the bank will now need to submit a plan which includes the establishment of a compliance committee, measures to improve reporting information, and an assessment of the bank’s staff within 60 days. In addition, East West has agreed to submitting plans detailing account controls for financial institutions abroad. The Pasadena, Calif.–based bank reported it has $982.8 million of loans held in overseas offices. East West maintains a branch in Hong Kong and an international banking subsidiary in Shanghai. As of Sept. 30, East West had $31.1 billion in assets, and more than 130 branches in the United States and Greater China. Plaza Bancorp reported $2.1 million in net income for the third quarter, the first full three-month period after buying Manhattan Bancorp. Plaza Bancorp is the holding company of Plaza Bank and what were Manhattan Bancorp and Bank of Manhattan. Plaza Bancorp’s third quarter earnings were compared to the $105,000 it posted last year. The parent of Royal Business Bank says it has signed an agreement to acquire the parent of TomatoBank. Assuming the deal is completed as expected in the first quarter of 2016, a unique brand name will disappear. RBB Bancorp operates one Royal Business Bank branch in Las Vegas servicing the Asian business community. The Los Angeles-based bank did not disclose plans for any additional branches in Southern Nevada. “We believe this transaction will enable us to more thoroughly serve customers and businesses in our market niche,” said Louis Chang, chairman of RBB Bancorp. The transaction will increase Royal Business Bank’s total assets to $1.5 billion. Once the acquisition of TFC Holding Co. and TomatoBank is completed, the offices and branches will become branches of Royal Business Bank.